“To be human is to live not in a world of things, but in a world of the meanings of things…We make the world in which we live by giving whatever meaning it has for us. And whatever we make, makes us.” (L.O. Thayer, “On Communication: Essays in Understanding,” 1987, pp. vii, x). Music is an image of our inner life, of the non-verbal flow of thought and feeling that comprises our consciousness. Others’ way of describing music are: “the sonorous image of life” (Suzanne Langer). “Music sounds the way moods feel” (Carrol Pratt). “Music begins where words leave off, describing our emotions/intuitions with notes instead of words” (Leonard Bernstein). Most music is entertainment, meant to be quickly and easily liked. Classical music is more than the pleasure of pretty sounds, or everyone would like it, like chocolate. Notes, like words, are vehicles for meaning (Suzanne Langer). As with words, attention is needed to follow the thought—in this case, musical thought (Lorin Maazel). Like communication, both listening and responding are a creative and interactive process. Music is movement, a sonic gesture—actually a composite of many smaller gestures, or phrases, with often a really big and powerful gesture towards the end. The listener interacts with the gesture, eventually getting to the point that the listener knows every move the music is going to make, as with any song one knows and likes. Deep listening happens when you interact with the flow of the music with your own energy, with your own inner gestures, as if singing along with the piece silently, and so you enter into a kind of dance with the music. But, like dancing with your partner embraced, first you have to learn the steps, or the moves your partner, the music, is going to make. Listeners learn the gestures or the moves of music the same way performers learn to make them—through repetition. You could even call it “practice”—listening practice. Most things are just things. Other things have interiority, like music and like people; there’s an outside and an inside. Like with people, classical music pieces take time to get to know. Their names are important and, like people, the names of pieces are easy once you know them. The stages of listening are like moving into a new house or apartment: 1) check it out from the outside 2) then you go inside and see what’s where, and then 3) move in! Then you interact with the space and make it yours; you make it beautiful with your furniture, plants, posters, photographs, etc. Music is a group experience that brings us in touch with ourselves and with each other, building on our commonality and community with a depth that is beyond words. The following story was published in Stanford University’s “Lively Arts” Magazine following the 2005 Van Cliburn International Piano Competition because the university had engaged the Gold Medal winner for a recital in October of that year. It’s easy to get to piano heaven, just go to Fort Worth for the Van Cliburn International Piano Competition. 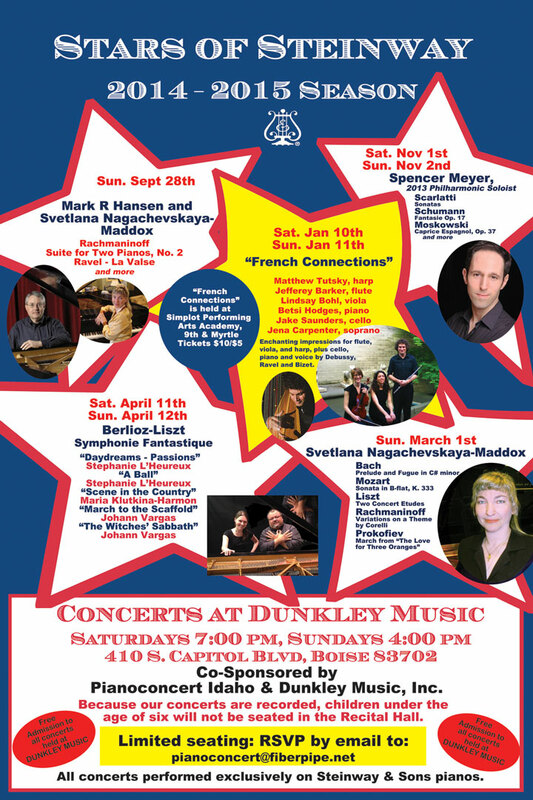 I’ve attended seven of the past eight competitions from day one because the joy of discovery fuels the fun—the discovery of ideas, of new repertoire, of new ways of hearing old repertoire, and of course, discovering the pianists themselves. This musical adventure goes along with the finding of new friends, and of old friends, and along with enjoying Texas hospitality and the many opportunities that Fort Worth offers, from the stockyards, Billy Bob’s and Joe Garcia’s, to the outstanding art museums The Kimbell, The Amon Carter, and The Modern. “Competition“ is really a misnomer because the event is so much more than that. Every four years, from mid May to early June, Fort Worth becomes the Bayreuth of the piano world. Evidence was everywhere. A tall office building decorated its entire outside walls with lights that read “PIANO FEST.“ Banners lined the streets. An additional 4-page supplement ran daily in the Fort Worth Star Telegram from May 18 to June 6, 2005, with photographs, reviews, and stories on every aspect of the event. Daily reviews and related stories also ran in the Dallas Morning News. Live performances were heard on radio and on the Cliburn web site. At the largest hotel in town the doormen and valet crew wore “Twelfth Van Cliburn International Piano Competition“ t-shirts and logo. (Each competition commissions its own new color design from a prominent artist). Cab drivers, waitresses, bar tenders, parking lot attendants, hotel staffs—virtually everyone—was conversant about what’s going on. And what’s going on was plenty. 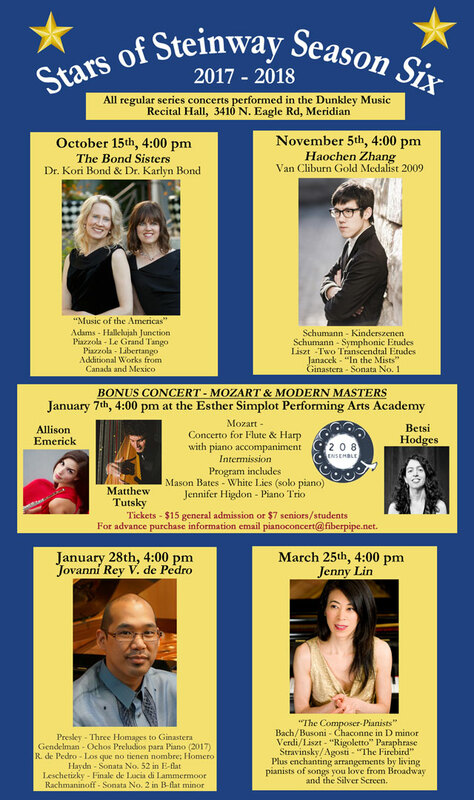 There were daily master classes, lectures and symposia for piano teachers and students at the TCU/Cliburn Piano Institute held at Texas Christian University, while downtown next to the spectacular Bass Performance Hall, panel discussions titled “Media and Music,” ”Music Critics,” and ”Meet the Jury” and more took place. ”Piano Marathons” happened at the library featuring performances by the pianists who did not continue into the semi-finalists. There was a five-day film festival on composers and classical performers by the French filmmaker Andy Sommer, who is producing the 90-minute P.B.S. film on the competition, ”In the Heart of Music,” to be aired October 3rd. Artist managers, critics, pianists, arts writers, concert producers, teachers, orchestra managers, news media and music lovers converged from Europe and America. To help entertain these visitors and the 11-member jury and their guests and the 35 competition pianists and their host families, five major parties (for 100 to 300 guests), one held at a huge working cattle ranch, plus many more smaller parties, all at Fort Worth’s finest homes, mixed high culture with local culture. And the lovely hospitality suite with Steinway grand at the top of the Worthington Hotel was open every day until midnight (or later if needed) hosted by locals who tended the hors d’oeuvres and the open bar. Fort Worth volunteers numbered in the hundreds hosting and transporting guests to and from the DFW airport. 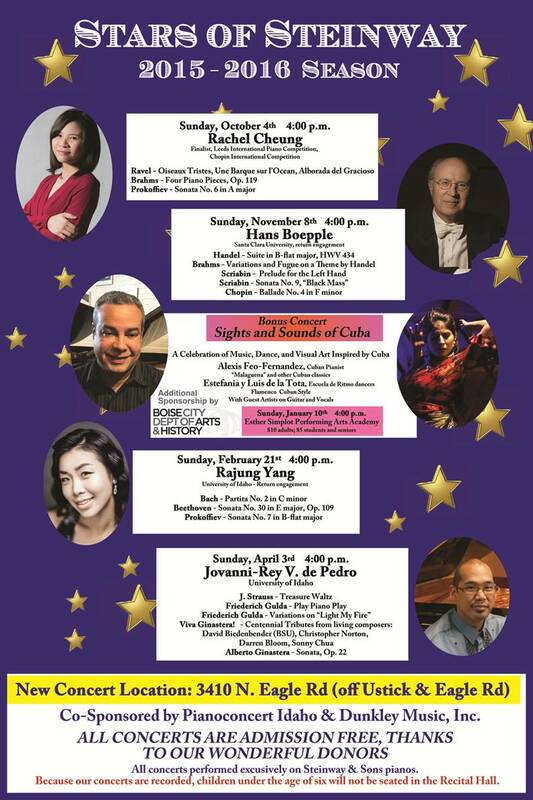 All this activity revolves around no less than 77 competition performances (solo, chamber, and concerto) by 35 of the best young pianists in the world today, hand picked by a jury of piano professionals who traveled the U.S., Europe and Russia to audition 147 of the 270 pianists who applied. While the competition is of course the centerpiece of the festival, the idea of competition is also what gives the event such broad appeal. Anyone who has ever applied for a job, or tried to get into a good school, or to win at an athletic event, can relate to that aspect, and this connection pushes the event well beyond the normal classical competition audience. “Will the Russian guy beat out the Chinese gal?” was a common question around town. The Van Cliburn Foundation itself produces far more than the quadrennial piano competition. Go to www.cliburn.org and you’ll find in addition to the management services of its winners, an annual concert series of internationally known artists, the piano competition for non-professional pianists, and an ongoing in-school education program among other endeavors. Contrary to common perception, the Foundation’s goal is not to launch a superstar into the firmament, but to simply help the careers of all who enter by showcasing the pianists and by awarding those who appear to be the most promising. The foundation further recognizes that pianists at the highest level are, as in any profession, equally proficient at what they do, and so the prize money of $20,000 is equal to the three medalists. Yet everyone has their preferences, and everyone likes a winner, so the medals of Gold, Silver and Crystal (new this year instead of Bronze, for some reason), are also awarded to show the subjective preferences, the matter of taste, of the jury. (Incidentally, this policy was actually proposed by myself and a fellow critic at the 1997 competition to help realize the Cliburn philosophy of non ranking, yet having “winners.”). The remaining three of the six finalists are simply titled “Finalist,” without ranking, and each receives $10,000. So who won these prizes? Lively Arts audiences will hear the Gold Medal winner, the 25 year-old Russian Alexander Kobrin, of whom even the Silver medal winner, the 19 year-old Korean Joyce Yang, thought highly. She said at the winners’ press conference that she loved his playing and told her teacher that he would probably win the competition. In a situation reminiscent of the 1991 competition, when a Russian woman (Kern) and a Uzbekistan man (Ioudenitch) each received the gold, Kobrin and Yang represent a kind of yin and yang of performance personalitiy: Kobrin the introvert and very serious, and Yang the extrovert who performs nearly always with some level of smile on her face. In a sense, this competition too was a tie, in that Kobrin got the Gold Medal, but Yang got the most prize money because of her additional prizes for best performance of a commissioned work ($5,000) and best chamber music performance ($6,000). The Crystal award winner, 25 year-old Chinese Sa Chen, who also provided some unforgettable performances, is personality-wise somewhere in between. The remaining three finalists were also outstanding: Davide Cabassi, 28 (Italy), Chu-Fang Huang, 22, (China), and Robert Plano, 26, (Italy). All these artists are first class, and the Cliburn Foundation is wise to defer from ranking as much as possible; preference at this level is truly a matter of taste. There are clear reasons why Kobrin was the preference, so to speak. I served as the reviewer for the competition’s blog for the preliminaries, during which I covered 35 performances in four days. This is what I wrote upon hearing his preliminary recital “The evening standout was the Russian Alexander Kobrin. His Haydn was the most stylistic so far of many in this competition, the Chopin nocturne finely spun, and the concluding Brahms-Paganini, both books, was musically glorious and technically thrilling. Kobrin doesn’t care for audiences much, his stage presence reminding me of Yakov Kasman two competitions ago. But the music he makes in spite of this is truly wonderful.” Another writer took over the blogging duties for the remaining phases of the competition, but I recall an exceptional Mozart Piano Concerto No. 20 in D minor, also a very fine Rachmaninoff “Rhapsody on a Theme by Pagainni” and a spellbinding performance of Ravel’s “Gaspard de la Nuit,” especially the slow movement. Kobrin’s accomplishment is reinforced by two new developments which made this competition different from the prior eleven. For the observer it’s easy to see why the event can be described as “piano heaven,” but for the participant the demands were quite the opposite. The first development is that 35 pianists were entered instead of the usual 30 because the screening jury found the level of performance so high. Also for the first time, more women than men entered (19 to 16), and China was the country with the most pianists (8). 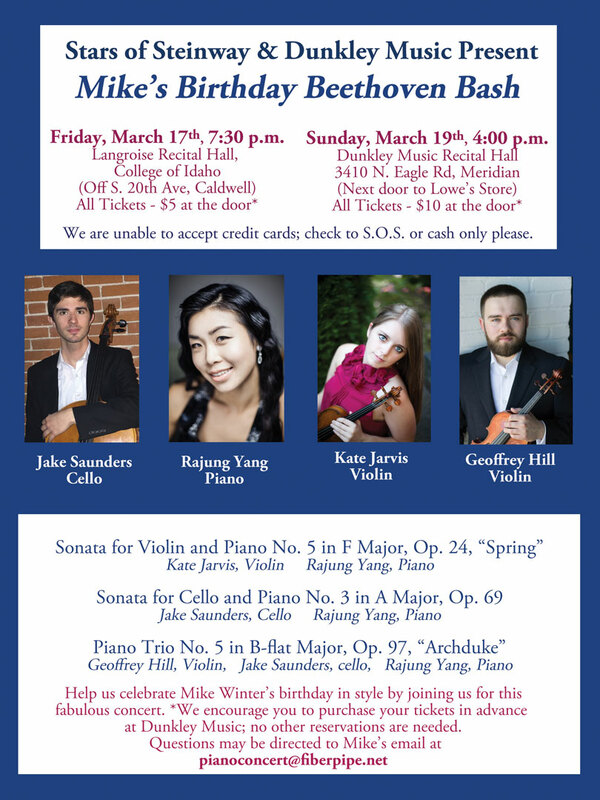 The second development was the new requirement of an additional hour-long solo recital in the finals phase, along with performances of two contrasting concertos with the Fort Worth Symphony conducted by James Conlon. “Cruel and unusual punishment” was the description of this additional repertoire requirement and schedule by one prominent piano professional. Kobrin, for example, found out late on a Sunday evening that he was one of six finalists and that he would perform, following of course rehearsals with the conductor and with the orchestra, his Mozart concerto Thursday evening, his Rachmaninoff Rhapsody late Saturday evening, and his third solo recital at 1:30 p.m. Sunday afternoon. When asked at the press conference if the requirements were too much, Kobrin didn’t ask for less repertoire, but for more time. “Just one day,” he stated. At eighteen days from the first official event to the last, the Cliburn already requires a lot of time, but if that one day could be found, not only the performers would benefit, but also the audience. It was clear to me, who had been listening since day one, that the media and the music world, most of whom arrive for the finals, were hearing the pianists at their most fatigued. The jury evaluations also had to deal with the question of fatigue and the sheer amount of music to be performed by those who go the distance. The jury made allowances, going by the overall impression rather than the most recent. Everyone stumbled. Joyce Yang threw in clinkers. Sa Chen had a major memory slip, bypassing about half the last movement of the Barber sonata. But Kobrin only slightly tripped, benefiting perhaps by his intensity. Off stage, however, Kobrin can be a character. He was seen getting piggy back rides from fellow finalist Davide Cabassi, and at the formal gala party that concluded the competition, I saw Kobrin galloping across the dance floor waving his arms as if riding a horse. No doubt his playfulness and much more will be heard in his playing when removed from competition pressures and heard by himself, not in relation to concurrent performances by other pianists. I’ve had a taste of such listening via subsequent radio broadcasts and via tapes of his performances, and I was astonished. When you enter Kobrin’s sound world on his own terms, you will find enormous expression and musical imagination. The jury chose wisely, and Lively Arts audiences are in for a gold medal treat. Mike Winter is a freelance classical music critic based in Boise who served as an official blogger for the 2005 and 2009 Van Cliburn International Piano Competitions, and will be blogging at www.cliburn.org for the 2013 competition, May 23 – June 9. 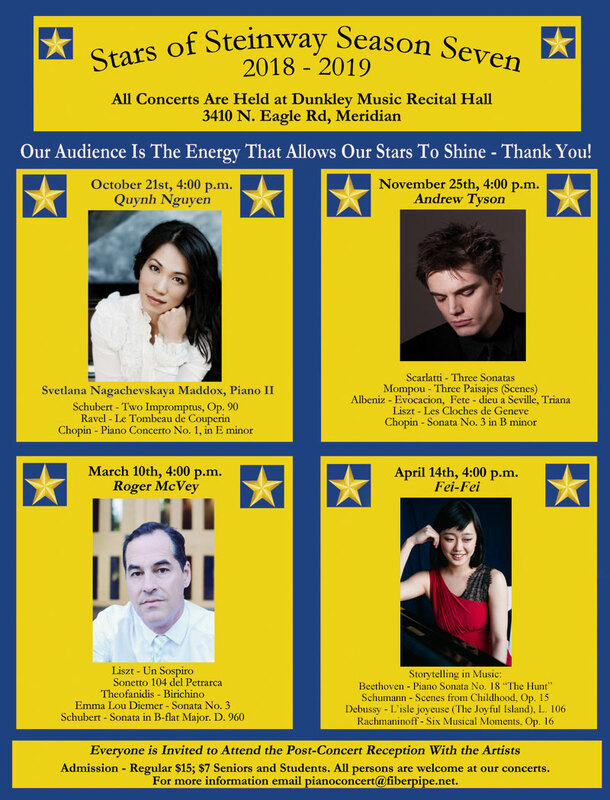 “Stars of Steinway” is a series of four piano recitals and one chamber music concert founded by Mike Winter in the summer of 2012. 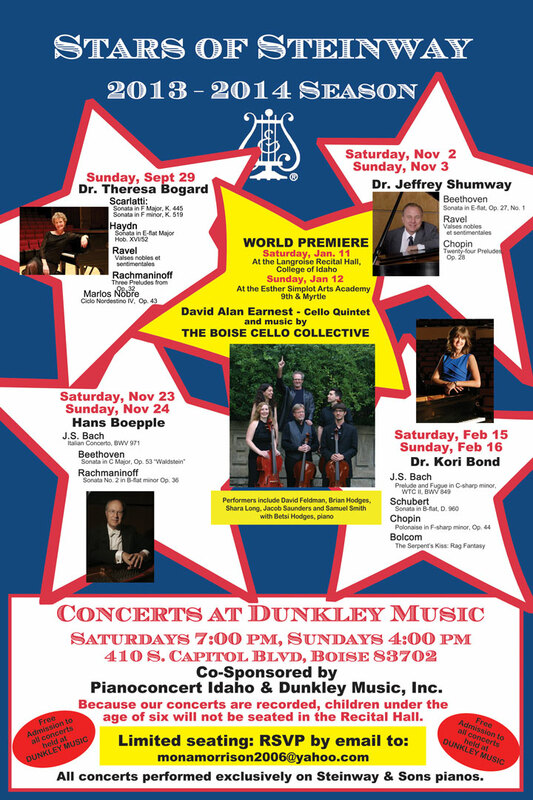 The five pairs of concerts are free and co-sponsored by Mike and his wife Mona Morrison, and Dunkley Music, the Steinway dealership in Boise, Idaho, for 63 years. The series is also supported by donations from the audience. 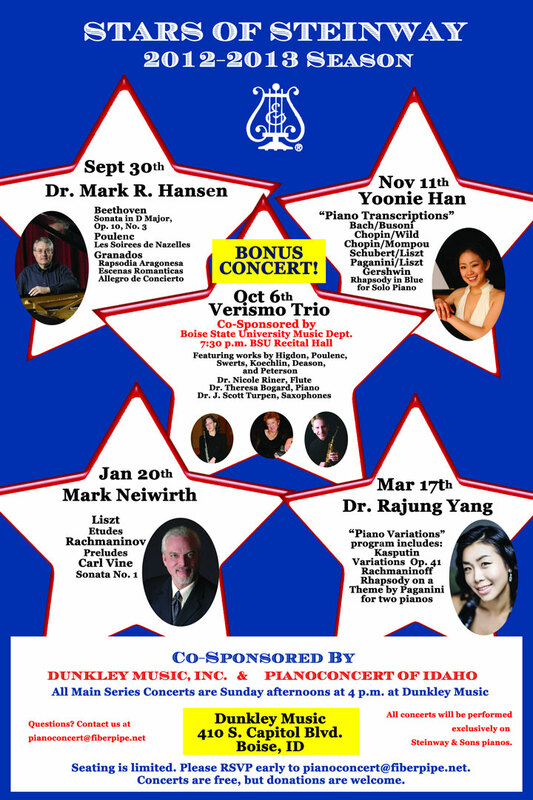 The purpose of “Stars of Steinway” is to celebrate the great repertoire for the instrument and the professional concert pianists who bring the notes to life. 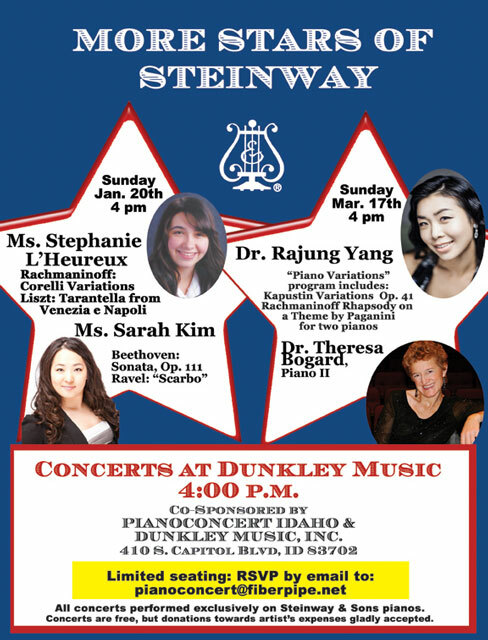 Mona Morrison has been employed by Dunkley Music, Idaho’s Steinway dealership since 1950, for 16 years. In addition to being the Store Manager, she is also the Director of Marketing and Institutional Sales. An Idaho native who moved to Boise from Twin Falls in 1974, Mona began music studies on piano at the age of nine, and added percussion and timpani in junior high school. She is now an active freelance musician and a regular member of the Opera Idaho Orchestra and the Boise Baroque Orchestra. She has also performed regularly with the Boise Philharmonic, the Ballet Idaho orchestra, the Caritas Chorale (Sun Valley), the Monterey Bay Symphony, and the Santa Cruz County Symphony. In addition to music, her passions include spoiling her 11 grandchildren, playing tennis, cooking gourmet meals, and traveling as much of the world as a busy schedule allows.